Always Keep in mind that a stray could be housing some very dangerous germs that you should be cautious about, because one bite from a rabid animal (if left untreated) could be fatal. So take precautionary measures to protect yourself first before you decide to handle the animal. Sensibly access the situation while keeping the critter calm and yourself safe. Examine the situation and try to figure out how badly hurt the animal is without aggravating it. do not try to handle any stray animals without some form of protection. Remember that the animal may not be used to being around humans and so will scratch or bite out of fear and self-defence. The creature does not know that you are trying to help it so do not back it into a corner causing it to fear for its life as this will stress the animal beyond what is necessary. Stay calm and be gentle when you are handling the stray animal. Do not cause it to over exhort itself as this will be detrimental to its wellbeing and even could slow down its recovery process. If you are able to catch the animal, then keep it in a cosy space where it will not be disturbed or feel stressed and if its small enough to fit in a box, make sure that the space is very well ventilated and lined with newspapers. You can make things as comfortable as possible for the animal by using old towels or a cushion on the ground for it to lay on. If you plan on adopting the animal as a pet, there are places you can get cat or dog beds for sale at affordable prices which will put the animal at ease and give it a familiar and comfortable space to have as its own. 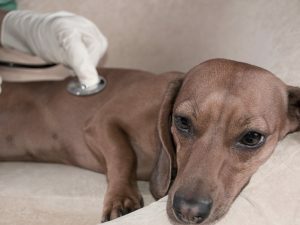 The first place you should go is the veterinary clinic especially if you can see that the animal is very badly hurt and is unlikely to recover on its own, if you have never been then do not worry as it is rarely a costly affair and everyone working there is generally friendly, informative and ready to help. Get professional help so that you know what to do and are better prepared to take care of the injured animal. By going to a vet you can check if the animal you found has broken any bones, sustained any internal injuries, ingested harmful food or only received some flesh wounds. The vet can pinpoint what the injury is which will enable you to decide how to proceed caring for the animal. Based on how bad the injuries are you can choose whether to care for it yourself or take it to an animal rehabilitation centre or wildlife rescue unit. Read up on the animal and its habits and food type and such other titbits. If you plan to nurse it back to health at home then you can get enough pet products online from Australia, no matter what you need you are bound to find it. So just search the internet from the comfort of your own home and understand everything you can about the animal in your care then do your best to help it recover.Caring for a hurt animal is not an easy task but as long as you handle it gently and sincerely work hard until it recovers you will truly feel like you made some difference in the world.